Recently http://healthyazblog.wordpress.com/beach/ posted a piece on experiencing a little “ah” and with it an image of a “Boca inlet.” Great blog, consider visiting it. 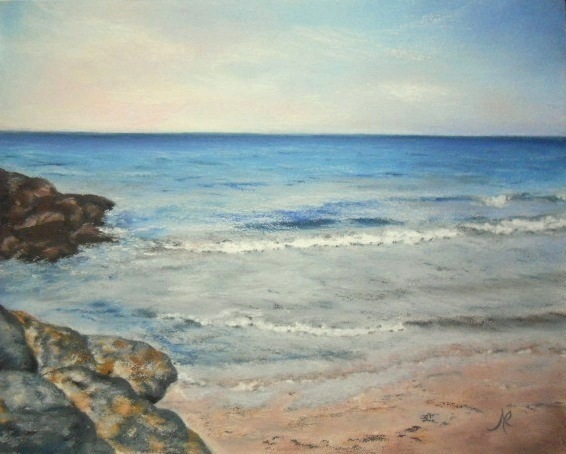 I couldn’t resist painting the scene posted of an inlet in Boca. With permission from the Author, I began to paint. What follows is my WIP (Work In Progress) – actually completed now. There are three photo’s below with a brief description of the painting process. The first image is the underpainting completed with soft pastels and an alcohol wash. I like doing this method of a underpainting because a paint brush is used to make patterns with the alcohol and soft pastel wash, which acts as a guide for when putting down the initial layers of oil pastels. In addition the image shows the first layers of (OPs) for the sky and background water. The initial layers in these two areas were layed down using the backside piece of foam insulation. Because this is a wide area of paint, the foam allows me to spread the OPs without damaging my finger tips. Underpainting w/soft pastels and an alcohol wash. 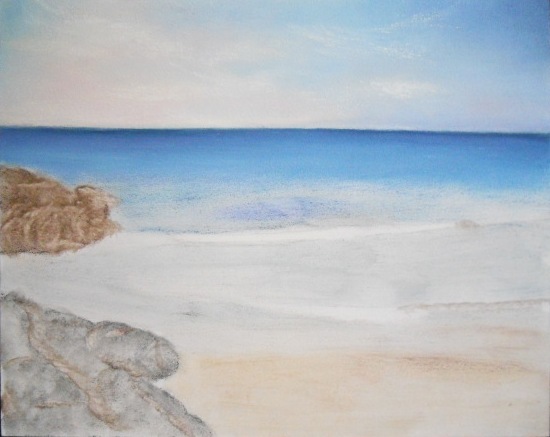 The second photo shows the continuation of laying down the oil pastels for the rest of the ocean, waves and foreground sand. 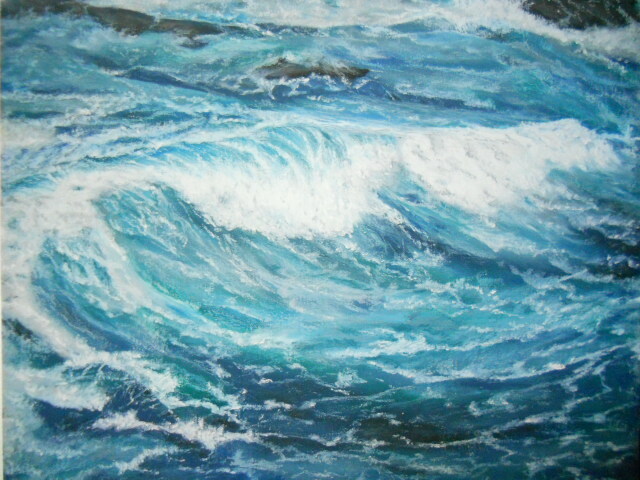 Oil Pastels layering done for rest of ocean, waves and foreground sand. 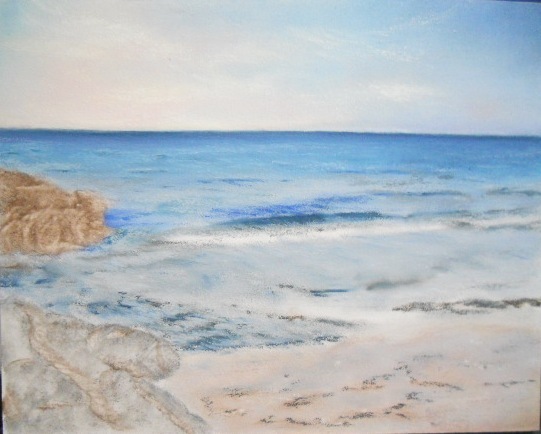 The third image is the completed painting, called the View at a Boca Inlet. Oil pastels were applied and blended with a tortillium and various clay shapers for the rocks and boulders, and at times my fingers. The painting is an 8 x 10 and took about 8 hours to complete. Please let me know if you have any questions on the process used, or if you have any comments on the completed painting. This was a great way to start and end my day yesterday! Very nice to see, your work in progress ! Hi Petronette: Thanks for your comment – glad you liked it! This looks beautiful – I can imagine it must take quite a bit of time. Hi ThelocaltravelerNS: thank you for your comment and your question. This particular oil pastel took about 8 hours from start to finish. The amount of time depends on the degree of blending/mixing of colors and level of details, some have taken upwards of 20+ hours like “Washing Ashore” that can be found under my Seascapes gallery.